"When the world was in turmoil, this tiny town in Gander didn't question anything," John Brant told BBC News backstage. "Their initial response was 'these people are in trouble and we need to help them, and I think that means a lot right now. I think audiences are being pulled towards a story which as about kindness, love and compassion." 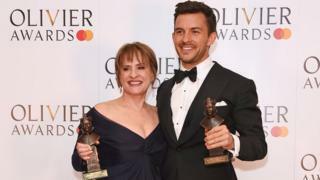 Other Olivier winners included Sharon D Clarke, who said she felt "deep, deep joy" as she won best actress in a musical for Caroline or Change.